Over at SMB Books, we're trying to build a place where consultants can find resources to make their companies more profitable. There are a couple of pieces to that puzzle. First, there are educational products (Exam Prep for 70-282, SharePoint Guide, etc.). These products help you learn the things you need to learn to get your job done. You can use them and pass them to your other techs. Second, we have marketing resources (books on marketing, for example). These help you find ways to bring more clients (and therefore dollars) into your business. Third, we have lots of procedural resources. 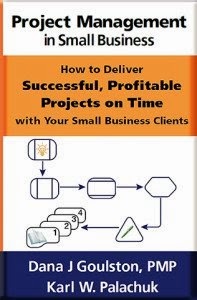 These are books and materials that help your improve the way you run your business. A great example here is . . . everything by Erick Simpson. And once in awhile we find a gem or two that help you do all of these. I have just added the two following white papers. They are almost free, but we think you'll find great value in them. That's right. Less than $5 USD. In Great Britain, that's the cost of a postage stamp! This is a 12-page white paper originally developed as an educational and marketing piece for our company. It covers backup strategies, backup options, and how to actually create an overall backup strategy. This piece can be used as fodder for creating your own client-facing white paper, or for educating your technicians on some of the overall philosophy around backups. Less than $10 USD. That's one British latte at Costa! This is a 12-page white paper originally developed as a how-to guide for our clients. It has been modified a bit so that it is also appropriate as a marketing piece. And it is extremely useful to technicians as a a click-by-click guide to cleaning out over-full Exchange mailboxes. This piece can be used as fodder for creating your own client-facing white paper, or for educating your technicians on procedures that can help avoid expanding that Exchange database. White papers are great marketing material. You can send out a standard Robin Robins 3-letter set and promise this great, educational white paper if they'll just . . . (insert call to action here). You can also just send it to clients. No, 90% won't read it. But they'll take you a bit more seriously and see your company as both a "good choice" and more professional than the trunk slammers with laser perf business cards. We print our white papers on 60# 11x17 paper, folded once and stapled. It makes a very nice handout. They are also great to include in your sales folder, or to give out at seminars and presentations. As corny as it sounds, I want to get these white papers into as many technicians hands as possible. I believe these are really good, useful tools. Even if you don't agree with our approach to backups or email, it will still be useful to see a well-reasoned argument for doing things a specific way. We want your white papers, too! If you're written a beefy (10+ pages) set of instructions on something that made money for your business, we'd like to share that with the rest of the SMB Community. It could be technical (e.g, how you manage firewalls, vpns, and private address space for clients) or related to marketing, call screening, hiring, firing, motivating, upselling, or meeting with your client for the first time. If you haven't read Michael Gerber's E-Myth Revisited, go get that immediately. One of his absolute keys to success is to document all of your processes and procedures. Focus your business on best practices and make it something where success can be duplicated again and again. Sharing our ideas about everything is a great way to help each other build best practices. Will your great ideas work in my company? I don't know? Will mine work in yours? Don't know. But sharing the ideas, and considering how they might fit in our different companies will certainly help us work on our business rather than just working in the business. Anyway . . . 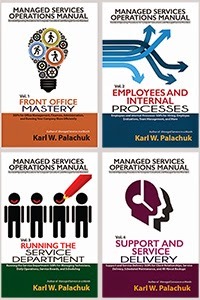 Check out the White Papers at SMB Books.com. Contribute if you can. 1. Why does your site take me away from the products page when I click to add an item to the cart? It's annoying to have to navigate back through the website to add another item. 2. I'm not going to pay six bucks to "ship" a few pages of a white paper to me. Why isn't there a download option? 2) Is fixed. I hadn't checked the digital product/no shipping button. 1) Is by design. In our old system people got a note that something was added to the the cart, but didn't feel they got a real confirmation about what was in their cart without consciously looking for it. After SMB Nation I'll look at a re-design to make this more elegant. Thanks for checking out the new stuff. "In Great Britain, that's the cost of a postage stamp!" There's many a true word said in jest. And thanks to the European Union out local post offices are closing down.